It’s very easy to be blind to a home’s eccentricities. We become so familiar with the funny layouts, annoying bits of design and odd habits we’ve acquired in managing our space that we forget to make any changes. 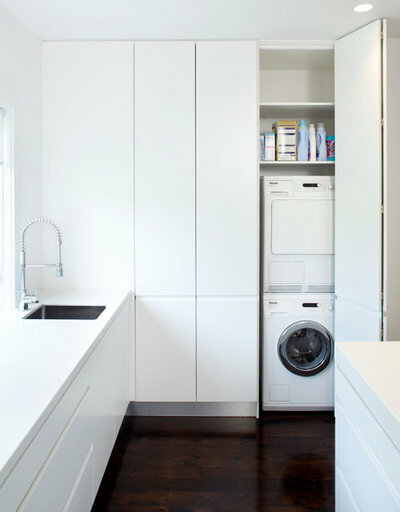 Sometimes, though, the tiniest tweak can make the biggest difference in how simple and enjoyable a home is to use. These little adjustments may seem obvious when spelled out, yet it’s still helpful to hear them again. So here are 10 straightforward ideas for improving your home that are as easy as one, two, three. 1. Rethink your hanging space. Clothes storage is often in short supply, and navigating an overstuffed wardrobe is frustrating. So make the space work hard and well by rethinking how you organize your clothes. Try color-coding them or creating a rail for each person, perhaps one above the other. And invest in good hangers to keep the clothes lined up neatly and in a uniform style. Wooden hangers support clothes well and last for years, while flat, velvet-covered hangers take up less space and, unlike wire ones, won’t stretch clothes. 2. Streamline your products. There are hundreds of bath products on the market, but many of us use only soap, shampoo and conditioner on a regular basis. 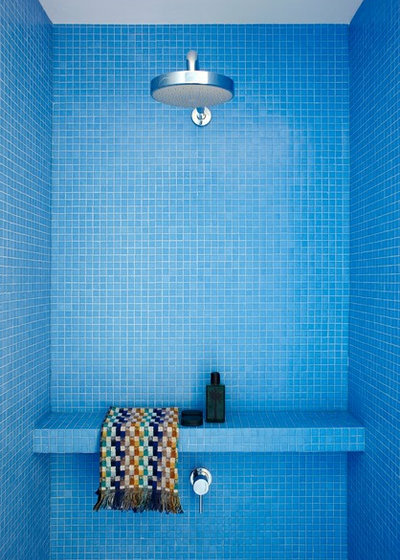 So pare down the jumble of bottles you have in your shower or by your tub to just the toiletries you use every day. Clearing the decks creates a calm, spa-like feel. 3. Seek out a sprig. Most of us agree that fresh flowers enhance a home, but the expense of buying a bouquet every week puts us off. It’s a shame to do without this simple pleasure, though. A few sculptural leaves, a couple of sprigs of wildflowers, or one or two artificial blooms don’t cost as much but still bring lots of pleasure. 4. Tuck a charity donation bag into your closet. All too often, we try on clothes and decide they don’t suit us anymore, then hang them up again. If you have a donation bag or basket in or by your closet, you can toss them straight in it instead. Once it’s full, take it to your local charity shop. It’s a great way to do a rolling edit of your wardrobe and keep it from becoming overstuffed with old, ill-fitting or rarely worn clothes. Work this idea into your children’s closets too. Kids grow out of their clothes fast, and the hanging space can quickly become clogged with too-small pieces. 5. Create a breakfast station. 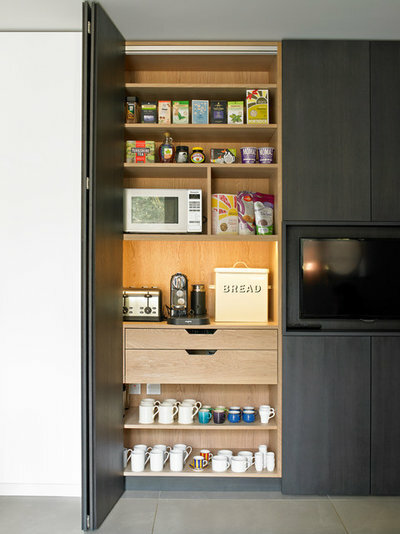 You don’t have to have a custom-built cabinet to rock the breakfast zone idea. Just make sure your kettle, coffee machine, toaster and, ideally, cups and tea bags are located in one area of your kitchen to make breakfast easy to pull together. 6. Store frequently used items close at hand — beautifully. Decorating and styling advice often leans toward clearing surfaces and minimizing clutter, but that just doesn’t suit some homeowners. Maybe you need your tubes of paint, makeup or craft materials handy because you use them every day. Trying to keep them stored away is fighting a losing battle when your instinct is to be a touch less tidy. The solution is a compromise. 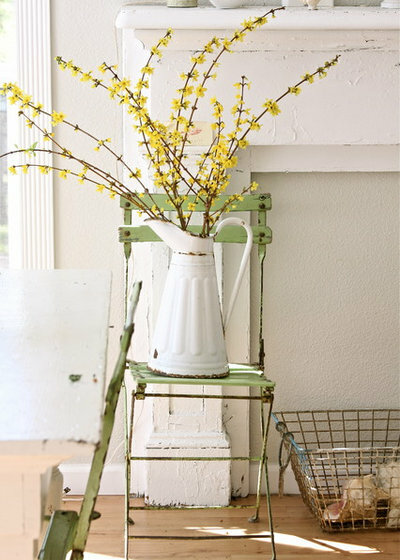 Keep those much-used materials at hand, but be sure to display them creatively. 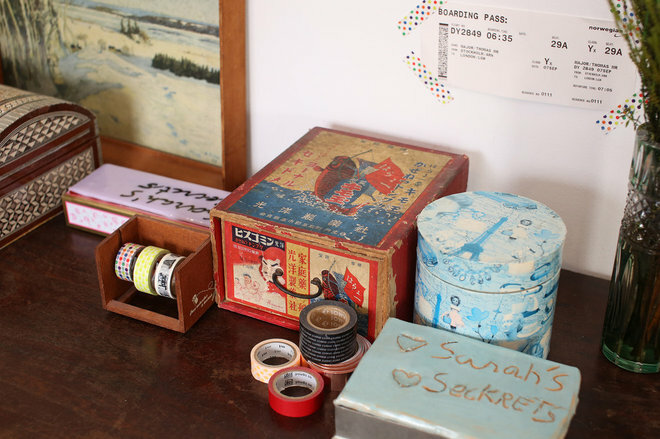 Heap makeup into pretty bowls, organize craft materials on a wall of pegboard, and find vintage storage tins and boxes that you can leave out on a countertop to hide things when they aren’t in use. 7. Keep cleaning products close to the objects they clean. Typically and without much thought, we keep our cleaning products in one place. Often, that’s under the kitchen sink or stashed in a utility room. This means wandering around the house with a bucketful of products to get to the room that needs cleaning. It’s far simpler to keep those products in the space where they’re needed. So store laundry detergent by the washing machine, and equip each bathroom, powder room and kitchen with its own set of cleaning products. It makes doing a quick touch-up much easier. 8. 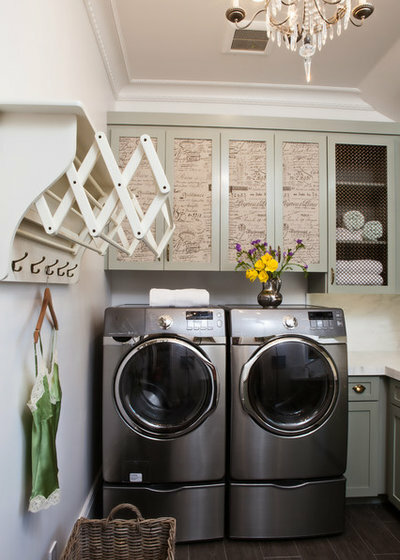 Put a clothes rack near the washer. Eliminate the trudge from washing machine to clothes rack, complete with heavy laundry basket loaded with damp clothes. Instead, fit a rack right by your washing machine. A wall-mounted design or one suspended from the ceiling is space-efficient. Or use a simple, portable clothes rack, but find a tidy spot where it can stay out of sight when not in use. 9. 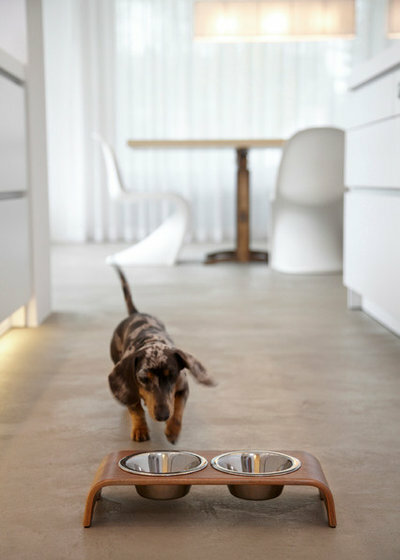 Relocate pet food bowls. Pets are often fed in the kitchen, but that can mean bowls lying on floor, just waiting to be kicked, and the unpleasant smell of a half-nibbled meal wafting around the space. Either pick up, wash and store the bowl after each meal or think about feeding your pet in a less public space. A utility room, porch or hallway could work as a better location, with just a small water bowl on hand in the kitchen, where you can easily check its level. 10. 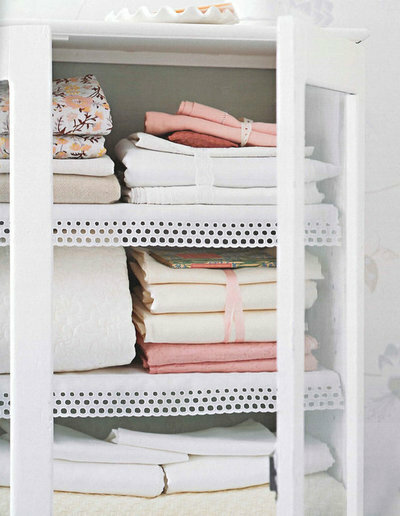 Organize bed linens. Storing your bedding as sets will save time rummaging for pillowcases. You can keep folded sheets together with a pretty ribbon or simply tuck them inside the pillowcase. When you want to change the bed, just grab the set and go. Next Post Trending Now: 20 Top New Entries to Welcome You Home See the photos of entryways and foyers that have been getting the most saves to ideabooks lately. Have you saved one of them too?